This easy winter salad recipe is a tasty option for a quick lunch or side salad with dinner. Baby kale is topped with pomegranate arils, juicy clementine and crunchy Asian pear along with creamy goat cheese. The whole thing is topped with a super easy honey Dijon vinaigrette. There’s a whole lot of flavours and textures in this satisfying green salad. Hey you guys! What’s up? Stopping in with a quick green salad recipe for ya today.—>right before any indulgent weekend eats or drinks (hello vino!) What’s your plan for this upcoming weekend? I gotta finish the latest season of Grace and Frankie on Netflix. Have you seen that show? It stars Jane Fonda and Lily Tomlin and I absolutely love it! So funny and heartwarming, but mostly funny and crazy (but good crazy, not like weird crazy, lol). I’m trying to space out the episodes cause I know that once it’s over, it’ll be awhile before the next season starts. That’s the good and bad thing about Netflix – everything is there ready for you to watch without commercials, but then you binge and it’s all over 🙁 Anywho, enough ranting…how ’bout some salad? There is absolutely no need to buy pre-made vinaigrettes at the grocery store. They require very few ingredients and you can customize to your taste. Plus, you know exactly what goes in there. There’s not weird sounding ingredients, all natural good stuff. Generally when I make homemade vinaigrettes, I use a 3 to 1 oil to vinegar ratio. So, if I use 3 tablespoons of oil, I use 1 tablespoon of vinegar. Easy, huh? You can totally customize to your liking. I made a delicious salad just last fall with a maple vinaigrette. Once you have the general ratio down, the possibilities are endless. Maybe you want to throw some herbs into the mix or use a different type of vinegar. Go for it! 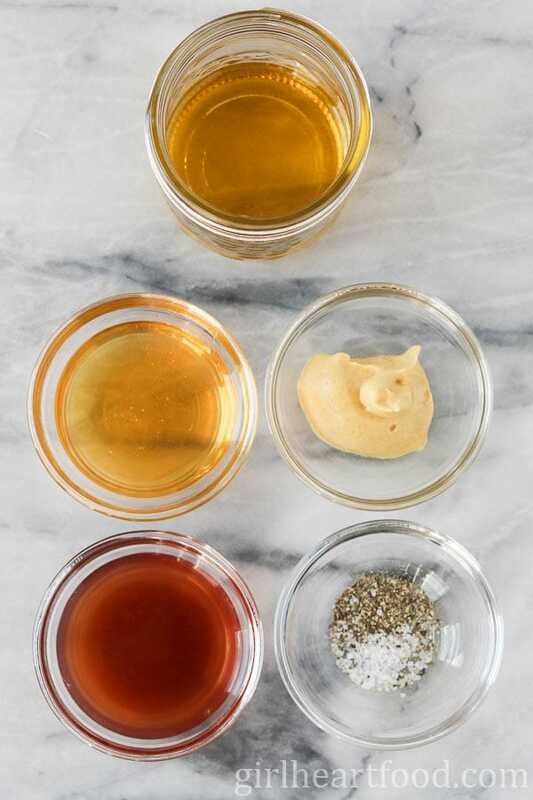 Once you have your ingredients settled, just place ’em all in a mason jar, cover, and shake until it’s all combined for one awesome homemade vinaigrette! Drizzle over your salad and dig in, my friends! I used baby kale here, but if that’s not your jam, feel free to use whatever green you like or even a mix of greens. If you want to add a little more oomph to this salad to make it more substantial for, say, dinner, some cooked chicken shredded or cubed over top would be lovely! Hope you enjoy this winter salad! Cheers to a fun and food filled weekend. This easy Winter Green Salad is a tasty option for a quick lunch or side salad with dinner. 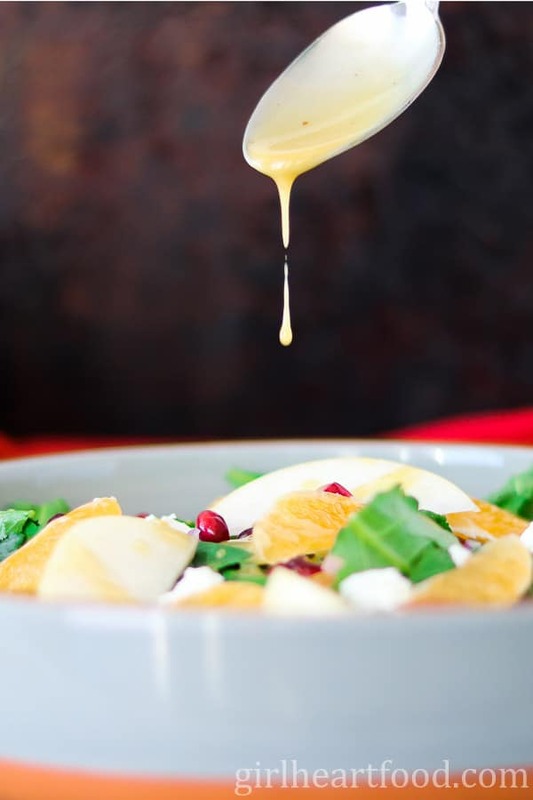 Baby kale is topped with pomegranate arils, juicy clementine and crunchy Asian pear along with creamy goat cheese. The whole thing is topped with a super easy honey Dijon vinaigrette. There's a whole lot of flavours and textures in this satisfying green salad. Place baby kale in bowl and top with remaining ingredients. Toss. Top with Honey Dijon Vinaigrette. Enjoy! Place all ingredients in a smal mason jar, cover, and shake to combine. I always think about salads in the summer time when it’s hot and I don’t want to cook, but we need salads in the winter too! Lately I’m finding I”m not eating enough greens! I’d better change that right now! This salad looks wonderful, especially the dressing! Have a great week! We sure do 😉 Thank you Kathy! Have a great week too! Amazing photos, Dawn!! So bright and colourful. The pomegranate is the perfect winter touch to this salad 🙂 I could definitely see myself making a big bowl of this and eating it over a few days for lunch!! Also – Grace and Frankie is awesome!! Awww- thanks Katherine! Great idea 😉 It is, isn’t it? One of my faves for sure! Love homemade vinaigrettes Dawn! So tasty and easy to make! And this salad look fresh and delicious! Have a great weekend! I know what you mean about not wanting to blow through episodes on a really good show. To be honest, we’re re-watching the second season of Master of None right now, because, SO GOOD! I love everything about this salad! Such a nice balance of sweet and savory, creamy and crunchy. And your photos are lovely! I am trying to eat salads every day for lunch to eat a bit healthier. I am adding this to my weekly plan. Thank you for the lovely inspiration. It is so pretty. I LOVE winter salads. And homemade vinaigrette beats anything you can buy at the store. Love this! So yesterday I had to have the cable company come out to fiddle with something because my box has been acting up and the tech asked if it was OK if he swapped the box out; I’d lose all my shows. And I was like, NOOOO. I have a bunch of Will and Graces saved on there! In the end he didn’t need to swap it but I totally feel your pain about the end of a season you love. I’m going to have a W&G bingeathon soon :). This is exactly how I love my salads. Light but still packed with alllllll the extras :). Hahahaha! That’s so funny, Kelsie, but I completely understand!! Have you watched the new Will and Grace? Love it! They haven’t missed a beat! Thank you! I heard someone mention Grace and Frankie today and had no idea what they were talking about. Now I know. Thanks Dawn! I love this salad and all the textures you get in every bite!! It’s soooo funny! Thanks Thao! Love the ingredients you’ve included in this winter salad Dawn! And that honey dijon vinaigrette sounds perfect. That’s one of my favorite dressings. Pinning and can’t wait to try! Honey dijon vinaigrette is one of my absolute favorite dressings EVER! It’s so easy and delicious. I bet it’s awesome with those tart winter fruits! This salad sounds awesome! Laura and I put ourselves on a salad diet recently, and I’m thinking a fun vinaigrette would be a way to mix it up. Plus, pears. I love pears, but for some reason I forget about them. I’ll grab a couple at the store today! And then goat cheese. ‘nuf said. 🙂 Laura convinced me to go back and watch Arrested Development on Netflix. Oh my god, that show. Freaking hilarious!! Hope you have a great weekend ahead, Dawn! Thank you David! I love ’em too but, like you, forget about ’em more times than not. I couldn’t get into Arrested Development, but hubby enjoyed it…maybe I have to give it another go 😉 Have a great week too! I love the combo of the Asian pear and baby kale. Throw a thinly sliced grilled chicken breast on top of this gorgeous salad and it will be dinner for me:) Love it! Pinning time!